I have been taught by the angels since I was a child to see the unique beauty within each person, all the physical beauty that is there, as well as the beauty and love that is in their heart. Looking at a person I am always shown wonderful personality attributes, gentleness and kindness (even in people who have told me they have done terrible things). 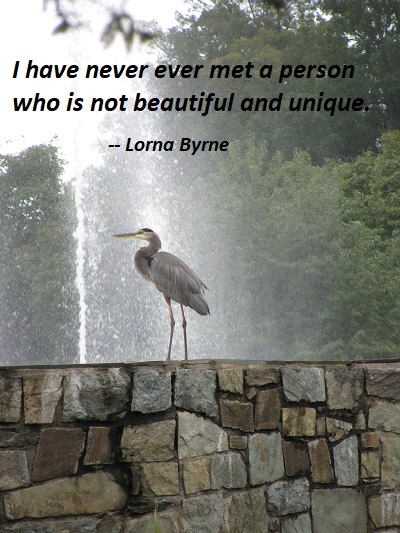 I have never ever met a person who is not beautiful and unique. But I know that so many of you struggle to believe this, just as you struggle to believe that you are pure love. Remember, no one is perfect — I’m not, you’re not, and no one in the world is. We are all humans with our frailties, so stop setting yourself an impossible standard to live up to. We are all unique, we are all different, so stop comparing yourself unfavorably to others — it makes life tougher than it needs to be and is a big barrier to self-love. This entry was posted on Saturday, October 27th, 2018 at 11:00 pm and is filed under Beauty, Core Value, Life, Love. You can follow any responses to this entry through the RSS 2.0 feed. You can leave a response, or trackback from your own site.